The magnitude of the divergences between the Nasdaq Composite & the Nasdaq Advancing vs. Declining Issues today is much more comparable to those leading up to the 2000 tech bubble market top & subsequent bear market than those leading up to the 2007 market top (compare the differential between both the magnitude & the slopes of both lines). 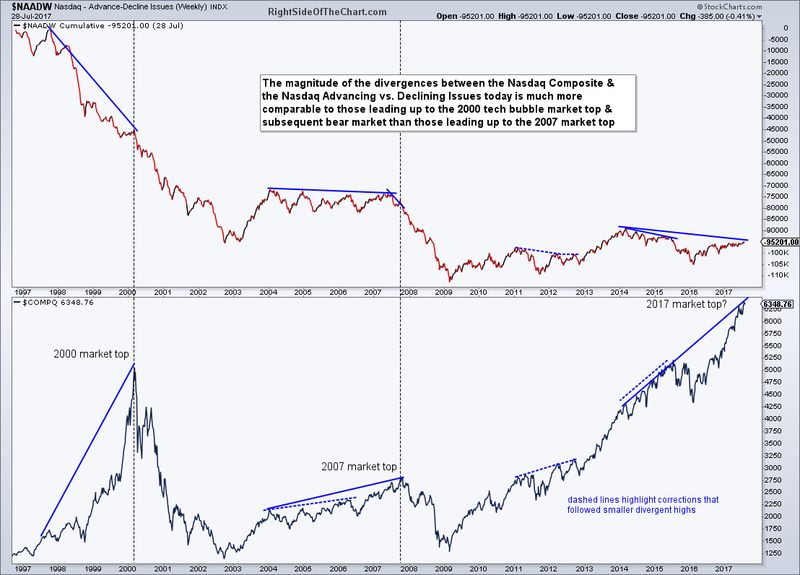 During a healthy advance, such as that off the 2002 lows, the 2009 lows, late 2012-early 2014, etc.., the A/D line will rise along with major stock indices, indicating broad participation among the majority of the stocks within that index. Divergence between an index & the A/D ratio indicates that fewer & fewer stocks are advancing, typically the mega-cap, over-owned & over-loved stocks (think FAAMGs) and such divergences has historically been a precursor to major market tops. While the primary trend remains bullish for now & these divergences aren’t anything remotely close to a sell signal, they do help provide a glimpse into just how powerful the next bear market is likely to be once this aging bull, the second longest in history & only 13 months shy of becoming the longest ever, will be. The longest bull market which spanned from October 1990-March 2000, was followed by a drop of nearly 80%. The profits to be made shorting the upcoming bear market will be nothing short of staggering, although there will be plenty of asset classes that will benefit from money flows out of stocks not to mention bear market rallies, which provide some of the most profitable long-side trades in very short order due to the combination of short-covering plus dip buyers. Although market internals continue to deteriorate with negative divergences still building on the monthly time frames all the way down to the daily & even 60-minute time frames on the US stock indices, we simply don’t have any half-decent sell signals or evidence of a trend reversal. As long as the primary trend remains bullish yet the risk-to-reward ratio in the broad market remains very unfavorable, I will continue to focus my efforts on trading individual stocks, sectors, commodities & other securities with the most attractive R/R profiles & clearly bullish or bearish technicals. Very good chart. Thanks. From my own point of view, your summary is perfect. I’d imagine that I sound like ‘the boy who cried wolf’ to some as I’ve posted quite a few charts on the building divergences & continued deterioration in market internals for a while now. I do my best to impress the point that these are not sell signals, merely an indication that all is not well under the hood & that the longer these divergences build, that is assuming they aren’t negated before a meaningful correction (15%+), the more powerful the ensuing trend reversal will be. I believe these charts help to prepare one’s expectation of just how powerful the next downtrend/bear market will be when it finally comes. For now, all trend indicators other than the shortest of short-term trends (on the intraday charts) remain bullish although that doesn’t imply an all-clear buy signal on the long-side due to the current posture of the charts & other factors. The way the charts are configured at this time, we could literally be just days or even hours away from some significant breakdowns on some key sectors & stocks which are quite likely to trigger such a swift selloff that most bulls won’t know what hit them & most bears or flexible (long & short) traders will be too slow to act in positioning at an optimal level. More on that soon.